A wide-eyed fantasy where a simple misunderstanding leads to big but happy consequences! K-3 readers will be captivated by a new series featuring Zee, and her magical companions – Pook the bookcase, Pikabu the butterfly, and Zippy the hummingbird. Zee knows "Accidents can lead to Adventures" and loves to be helpful "Just 'cause!" With the aid of her friends, Zee travels through an enchanted doorway in her bedroom to other worlds, to find her helping solutions. However, Zee is a little girl, so she doesn't always understand the problem she's trying to solve. 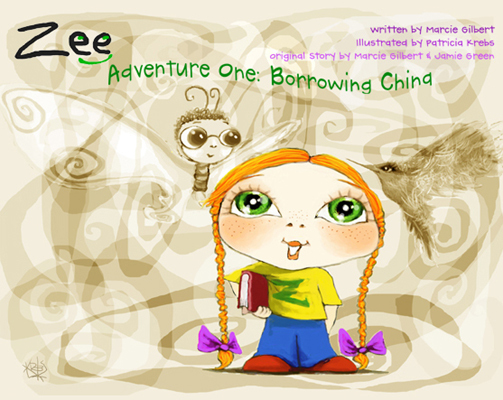 In Adventure One: Borrowing China, Zee attempts to borrow the country of China for her mom's dinner party, not realizing that her mom is looking to rent fancy dishes. Exquisite illustrations, whimsical storytelling, funny-bones twist, integrity, and suspense – you’ll want to jump inside! Pikabu can create a passageway to another world in the middle of Zee's room, by fluttering his wings.